- Color: Black,Wine Red,Navy Blue,Coffee. 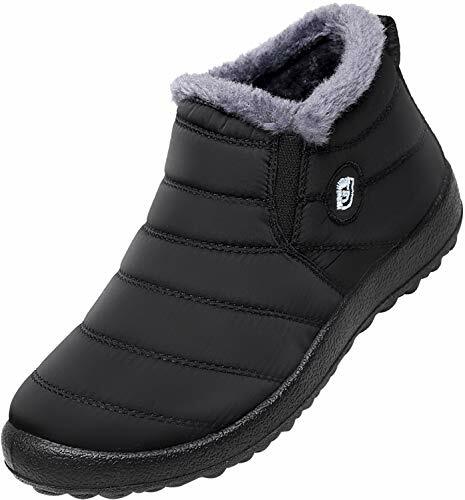 - Toasty fur lining provides an added warm layer for your feet. - Premium Fur Lining snow boots makes a pair of warm, fashion snow boots are also a perfect gift for family and friends. - Rugged rubber sole with texturing on the bottom for an excellent grip. - Top-quality upper in oxford cloth for for a dry comfort. - The shoes with a high quality elastic band for easy on and off. - We recommend that you hand wash and air dry them. Winter is coming. Do you need a pair of snow boots is of both warmth and fashion? Then this pair of boots is a great choice.These snow boots fully meet demands of those womens who wants to wear in colors when others wear in plain style in such a pallid season. Waterproof vamp:Made of quality Waterproof oxford cloth,feel soft,waterproof, warm, comfortable.Ensure all-day dry comfort by blocking rain, snow or any other liquid from invading and are easy to clean with cloth. Soft Sole: Ultra-wear resistant polyurethane, non-slip, resilient, shockproof; comfortable for long time's wear and walking.The special design of the sole have a strong grip, superior anti-skid performance, greatly enhance the safety. Suitable for Multi Occasion : Indoor & Outdoor activities,Daily walking,Travel and So on.Great Festival Gift:These warm shoes make a great gift for him or her! Just for the Valentine's Day、Christmas、Thanksgiving Day、 New Year's Day !